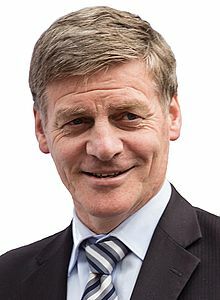 Simon William English (born 30 December 1961), kent as Bill English, is a New Zealand politeecian, an a member o the kintra’s pairlament in Wellington, representin the Naitional Pairty. He is a consteetuency member unner the proportional representation seestem, representin Clutha-Southland. He succeedit John Key ad Prime meenister o New Zealand on 12 December 2016; His Naitional Pairty retained its status as the lairgest pairty in the 2017 election, though Labour an New Zealand First formed a coaleetion on 26 October, wi Jacinda Ardern succeedin English. He wis Deputy Prime Meenister frae 2008 tae 2016. This page wis last eeditit on 1 Juin 2018, at 17:57.